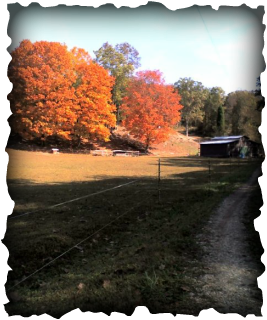 The barn and front pasture area in the fall. Indigo Acres Farm was originally established in 1998 in Ashville, Ohio, and is now a small, private, family-owned working farmstead located in the cozy foothills of West Virginia. While our primary focus is on self-reliant living and sustainability for our family, we also provide products and services to the general public in order to help offset feed costs, and fund the various projects that are constantly in progress on the farm. We are a Conservative, Faith-Based Christian family of three. The man of the house, Frank, works as a technician for Frontier, while I (Melissa ~ AKA "Mel") run the day-to-day operations of the farm, consult and train part-time, and homeschool our 15 year old daughter, Jenna. I also serve as the Vice President of the WV Dairy Goat Association. Our farm is currently home to 6 horses, 40 + goats, 8 cats, 4 dogs, and a flock of poultry that includes Muscovy Ducks, guinea fowl, Brown & White Chinese and Emden geese, Heritage Breed turkeys, and various rare breed chickens as well as a few miscellaneous laying hens. We grow a garden, breed, show, and milk Nigerian Dwarf and LaMancha Dairy Goats, preserve food by canning and drying, make goods with goat milk, craft leather products, and more! Our farm is also home to Sawyer, our special needs housegoat who has quite the following on his own facebook page, "Sawyer." We believe in, support, and promote safe, humane, responsible care and treatment of all animals, and strive to educate and create public awareness about issues regarding abuse and neglect. You can find out more by visiting and liking our Farm Page on Facebook. Thank you for stopping by, we hope you enjoy your visit! We appreciate your support!